High resolution graphical logos. Please refer to our required logos for your webshop. All logos is RGB colors - and only for digital use. Using these banners when you can receive payments via MobilePay Online. Use one of these banners for your webshop. 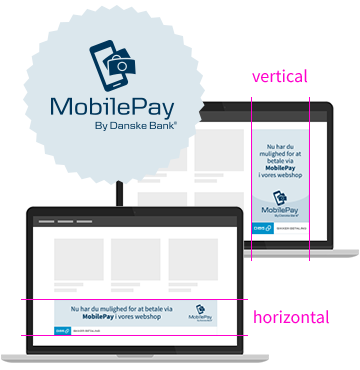 They come in 2 different layouts – vertical and horizontal – whatever matches your webshop’s layout/grid. The banners are made in 3 sizes and they are approved by Danske Bank. Available in these sizes, small 120px, medium 140px og large 180px. Available in these sizes, small 480px, medium 580px og large 740px.